This is a quick study I did for Jimmy's (IWS) steel moment frame house. It was primarily to look at the shapes of the floors, the continuity of structure, material juxtaposition, a zoning and house organizations study and a few little thumbnails renderings. It started as a means for me to analyze the concept of a masonry mechanical core. A tower housing bathrooms on each floor, laundry and chute, dumbwaiter and utilities core for heat, power, air, water and possibly light. It also was the structure for the stairs and primary lateral loads. The thumbnail sketches are simple and quick allowing for exploration of an idea while generating images i find very helpful in exploring materials, massing, proportions, light, mixed uses, etc. I particularly like the bottom left. However, after doing another study in my sketch book and drawing over shapes generated with colored pencils, I came up with a much better way to show off Jimmy's metal working skills. Build giant exposed trusses and inhabit the spaces in between. Spaces upstairs and downstairs will materialize in the space between the giant trusses (over 30' long and up to 14' tall spaced 8-10' apart) laterally and the main floor will be the space between the trusses vertically. 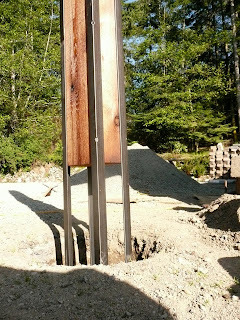 An abstract of Jimmy's upper trusses, the inverted trusses below and the moment frame that will connect them. Acquire all materials, wood, steel, screws, bolts, and tools. Resolve design or decide to just go with a good idea and a solid design build process. Pull lines, define ends/corners on the ground and lay out project full scale. Mock ups if necessary are always worth the time. Call utilities-before you dig!! Clean out holes and straighten, getting depth, angle, and size right. Prepare all parts. In this case wood and steel. Have a good space to work! 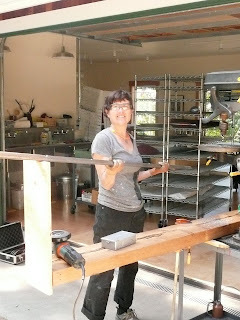 Make jigs for tools and materials to make preping safe and ergonomic. Murphey's law-Plan to spend an extra hour extricating a large, unplanned for rock, right in the bottom of your hole. Perform as many operations as you can on the sawhorses. Begin putting parts in place. Add pieces, one by one, bracing thoroughly as you proceed. An added step, if you didn't have a utility check, you'll experience delay and a visit by the repair folks. Sometimes it's easier to keep options open and perform a few tasks in place, even if on a ladder. This allows for increased flexibility and can help reduce unnecessary mistakes. Make a few cuts, notches or adjustments along the way to improve quality. Here I'm using plywood, left over from another project, to help brace the heavy posts and hold them at the right level, using my original story boards as braces to keep me true to lay out. Now, the project is ready for the concrete pour. Always, step back from the project at the end of the day and check it out. Here Lois, another client very interested in being part of the process, covers the cardboard with mulch to control the weeds in her new mounds. It takes a lot of cardboard to do this. Usually I get bundles of cardboard from Hanson's Building Supply who donates their cardboard to my restoration projects. These boxes of 'green' designer cardboard, from Italy, work great. They were pretty expensive but did come with products inside. Lois' new chairs!! What's interesting to me is that the chairs with the white coverings, even though light, airy and translucent, created a considerable bulk, adding too much mass to the room. But upon removing the covers, the taller than normal chairs (26" chair height for 36" counter) disappear on the fir flooring and in front of the architectural steel. The chairs look great next to the machine (kitchen island) and the cabinets but don't dominate. Perfect! Got an idea but no wood? Let us at dbBrad help design and craft your idea into reality! 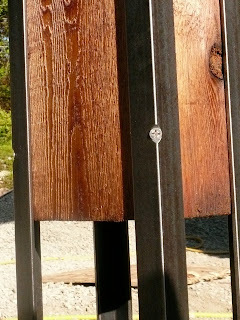 This wood came from GP site in Bellingham and needs a project to be incorporated into. Clear fir 4x4's treated and semi-toxic and best used outside. It is very suitable for re-milling and furniture. To learn now this wood could be used for your idea, contact dbBrad today. This is a piece-of-art fence. Here's the first post. 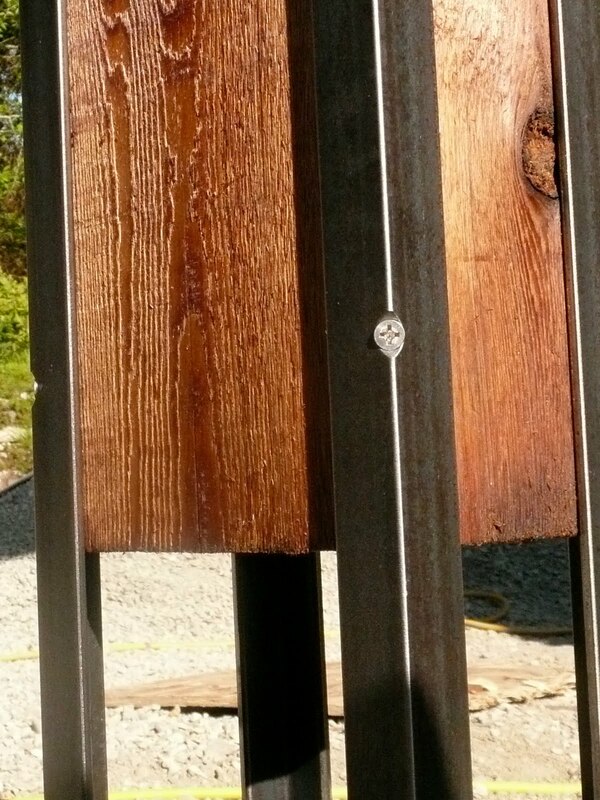 Even though the posts are cedar, we treated them with Rosewood oil so they will look newer longer and have increased longevity. Cheryl spent an entire day drilling and countersinking holes. Six holes per angle, 4 angles per post, 6 posts total makes 144 holes. Below you can see the jig we made to align and support the long and relatively heavy pieces of 1-1/4" X 1-1/4" X 1/4" angle iron. We still had to spend another day cutting to length, wire brushing and clear coating. tools often needed on site. Process-The process of preparation is very important to a quality finished project. Sometimes prep work can take far longer than assembly. The steel pictured below is all drilled through the inside corner, flipped and countersunk, flapper wheeled on the edges and corner and then wire brushed with a large stiff cup brush. The effect is not shiny but a wonderful satin that seems to emphasize the qualities of the hot rolled steel. The steel all lined up and ready to clear coat (satin, not gloss!). I love the design of these saw horses. Two pieces of beam less than 4' long-scrap to anyone else. A quick 10 degree bevel on top edge and a few minutes with a skill saw and chisel putting a 1" deep notch on the beveled portion for the legs, 4 sturdy tight grained 2"x8" legs (also scrap-cut to length), 4 -1/2" bolts and done. Less than an hour total time and with no bracing on the legs. 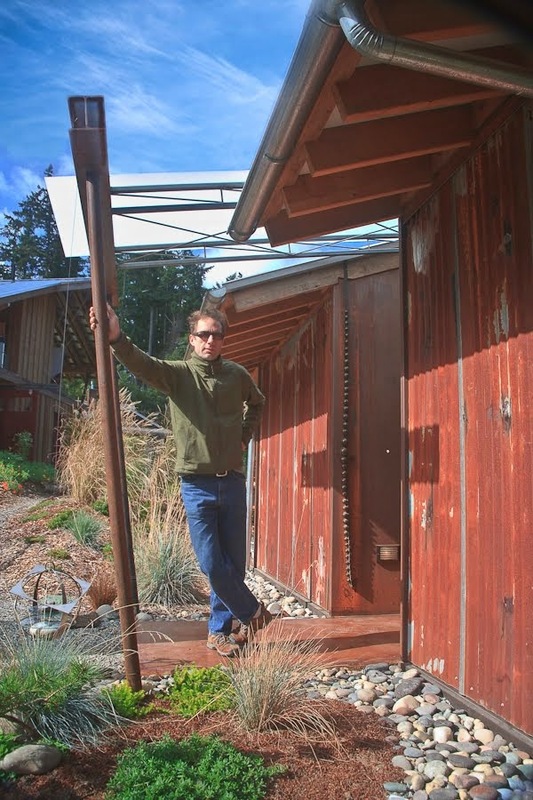 Built for the fredley project to process the recycled wood, they were inspired by scraps that came with the load of 2x8's from Tacoma and have continued to serve well on numerous dbBrad jobs. I've had over 3500 pounds on the pair of scrap saw horses and have been using them outside for 4 years now. I wonder if they aren't stronger now than they were initially with the wood swollen up and tight! The most amazing loads of lumber end up on the dbBrad truck. 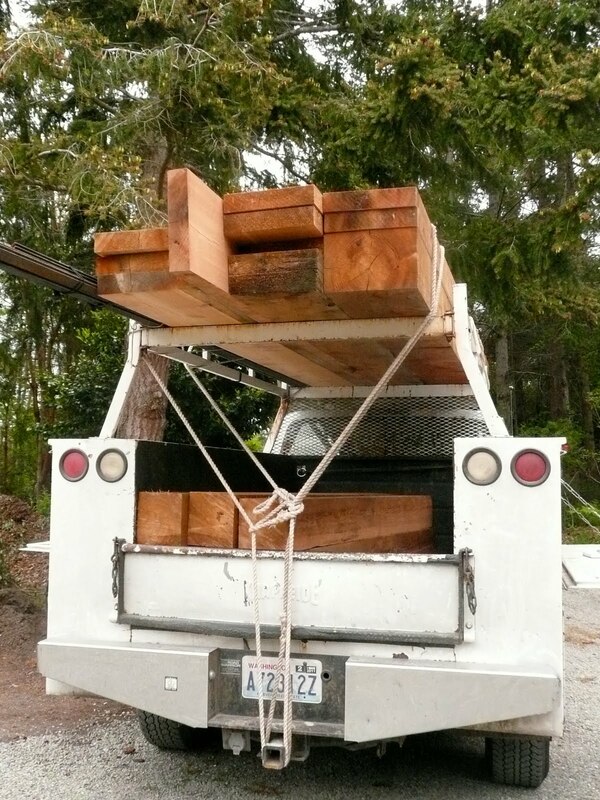 Here a full load of cedar and 400 pounds of steel are transported. There is wood here for two projects, Kieth and Lindsay's stairs and Cheryl's fence. As recent as the 80's I can remember watching and smelling large cedar timbers left over from jobs being chainsawed for firewood (rather than returning them). It was beautiful wood but too cheap and there was lots of it. So much infact that nobody bothered to conserve the resource. Not any longer. Finding lumber like this for my projects is only affordable now as a salvaged material. I haven't seen any new cedar of substantial size that was worth cutting a tree for in over a decade. Cheryl Lawrence (living gate and iron fence) who is good friends with Tommy and Matthew purchased an 'Eddies White Wonder', a hybrid Dogwood which will bloom every year around this time, on Matthew's Birthday. I picked it up and delivered it today along with a few gold fish and a water plant! Top: Matthew and Tommie proud of their first tree! Above: Cheryl and Tommie contemplate the position of the dogwood. The tree will go on the far side of the pond, behind the cedar logs and big rocks, and will reflect into the pond. The pond, with thousands of gallons of water already, only has water in the central deep portion. It still has about 30" of water needed to reach capacity. Once full, we can do the final grading around the edge. Above and Below: A quick demonstration of tree planting which involves hole prep, soil mixing, adjusting height to avoid crown rot and a deep initial watering. It's of interest to me whether we could introduce a local species of fish into the ponds. Apparently you need a permit to obtain them and as a result no fish breeders raise them. It seems they might be available through the Department of Fish and Wildlife. The controls are in place in an effort to protect our native fish in their natural habitat. I wanted Koi but couldn't find any locally so I settled on goldfish. We place 30 gold fish in the large pond, plus 2 comets in the upper pond. They will help eat bugs and algae and larvae in the water and will grow up to 6"-8" if other wild life doesn't find them first. Below: Matthew releases the two pool comets into the upper pond. Week 2 was as fast paced as week 1 and equally exciting with the rain. Even in the day's previous to the rain, the pond continued to fill up from the liquified layer about 30" below grade which we bailed out in an effort to minimize mud. Staging of items is important to minimize track time. Having items where needed is handy but with so many lineal feet of edge and such big rocks and such a small machine, maintaining access was tricky. Two Above: Materials being staged. In order to maintain the wetland around the ponds, we moved the dirt to fill in low areas that were flooding and to control where the water goes. The Nissan gets loaded with dirt. Lots of raking and edge work are necessary prior to installing the liners. We really wanted to get the liner in as soon as possible to control the mud, both in the pond and around the edges. To properly detail the liner, excavation had to happen 2-3' beyond our intended water edge. Though we had to stop for rain, it was great to see the upper pond full, the stream running, our pool in the stream filling up and the delta formed by the water entering our big pond. By dumping water from the bottom of the big pond into the wetland, we were also able to see our first water in the wetland. Lot's of tractor work happened, the pond began to take shape and the upper pond's liner was installed. Other site work included picking out rocks and ordering more materials, mining damaged sections of the forest to use in our restoration, ridding the property of thistles and holly and taking a couple days off because of the rain! Above: View of the entire project from the outflow of the wetland. maintenance of property, plus allows the owners access and enjoyment to their property. What a great day, or day and a half! Joe and I and Charles Locke, the house captain, met early in the week to discuss the game plan. I was skeptical, at best, that we could finish the project in a day, so we made a plan to attack the roof on Friday. Four of us (Josh, Joe, Charles and myself) showed up after lunch, plus the owner's son, Luke, and worked until 6:00 that evening getting a jump on things. My concern was access to the roof, the height, the slope, finishing the project and keeping volunteers busy, all while having fun. Our project was to tear off shingles, re-sheath the roof, tar paper, flash, and install metal roofing and metal trim on half a roof, about 760 sf. Here the owner of the house and the safety captain look on as we bend some of the rules of safety in an effort to finish the project on time! We had a great crew. Charles Locke, Back In The Woods Works, was very knowledgeable and well equipped and brought a working partner Chad. Don Lash, who now lives in Everett, showed up as he does every year and was an incredibly hard worker. 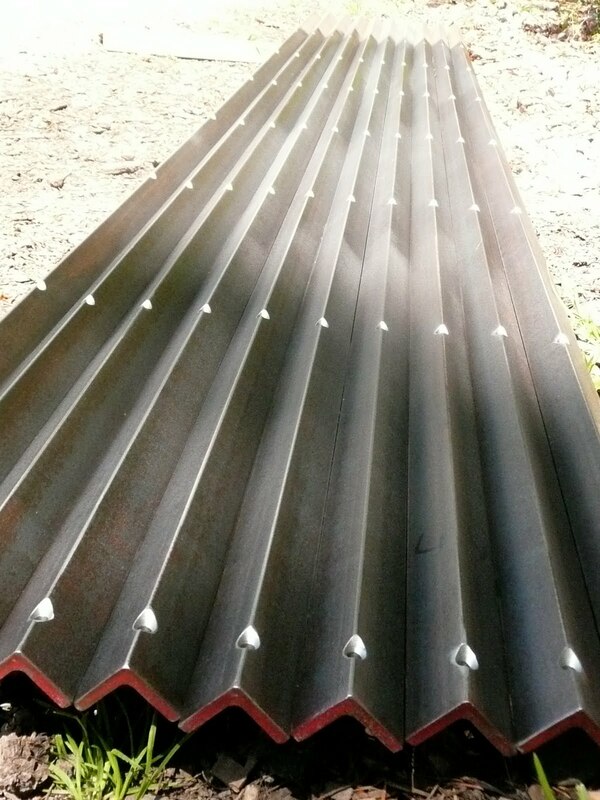 Two men, who's names have escaped me, one of whom had his son with him (very disappointed by the cut off of 18yrs for being on the roof), were the keystones to the whole operation and spent all day on the steep roof wearing harnesses and installing all the metal sheets. Joe and I came in behind and did the fussy trim at the gable ends and the ridge cap. It was a tough and slow task, so by the time we got down, we were back to the original four--Charles, Joe, Josh and myself--the only workers still on site. However, all in all, the hard work, the companionship, the amazing generosity of the community and the kindness I saw between young and old, republican and democrat, rich and poor was amazing. Maybe every day should be a Hearts and Hammers day. It's amazing what Joe will do to get the job done, and always with good humor. This big boulder slipped off the shelf and needed to be retrieved. Between a sling, a piece of rope, re-arranging the tractor, and then swimming to pull the liner out of harms way, the rescue succeeded. Photos: Joe, as honest as he is trusting, defines a new category for Labor and Industries!